Allen Edmonds Higgins Mill in 7563 Natural (size 13D). Wisconsin, USA. $350. Purchase. Truman Boot Co Marrone Horse Rump Pull Up (size 13D). Colorado, USA. $530. Purchase. Alden 5 Eyelet Plain Toe Commando in Brown Chromexcel (size 12D). Massachusetts, USA. $593. Purchase. 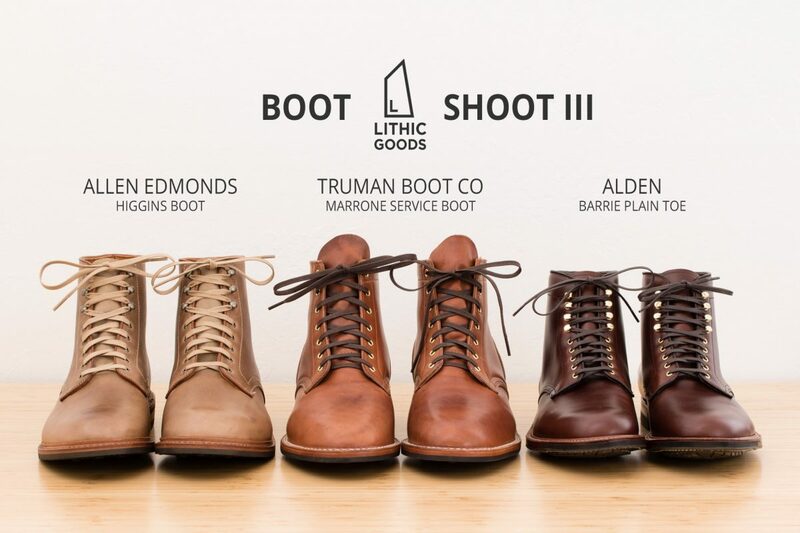 The third installment of the Lithic Goods Boot Shoot is under way with three premium pairs of Made in the USA boots. The first Boot Shoot featured: Alden, Oak Street, Red Wing, Wolverine, and Timberland and the second shoot: Eastland, Frye, Woolrich, & Chippewa. 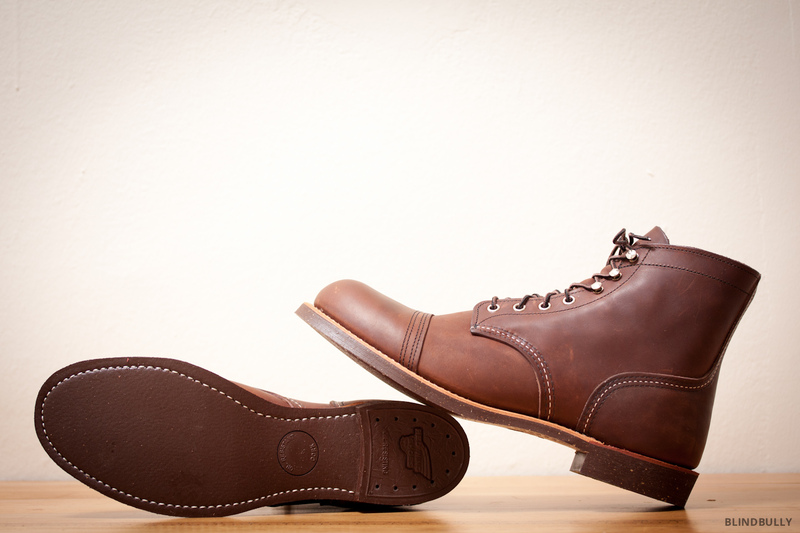 Truman Boot Co is a charging young company based out of Boulder, Colorado. They’ve been gaining traction through word of mouth and social media, where they enjoy sharing behind the scenes photos of their boot production, material selection, and experimental designs. Their boots caught my eye last year and I’ve been itching to review them ever since. 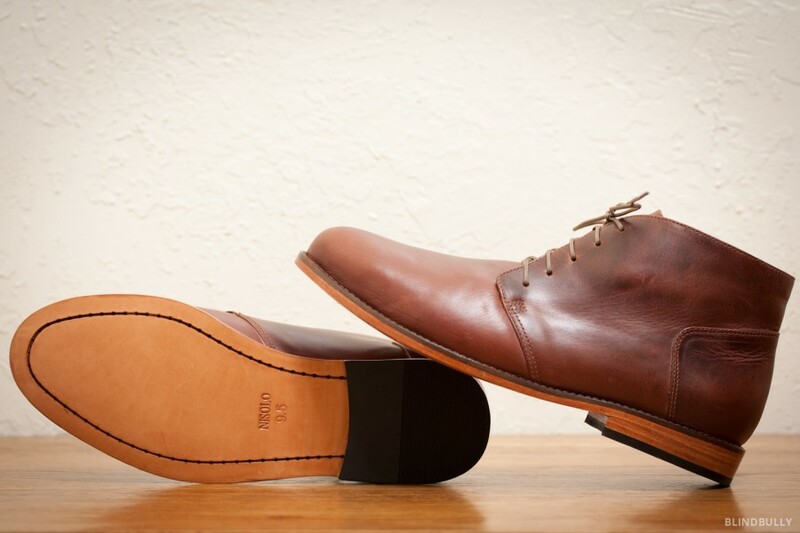 Allen Edmonds has been around since 1922, but IMO haven’t put forth a worthy contender to the casual boot market until now with the Higgins Mill. Alden has been in the casual boot market a long time with their cult classic indy boot and various permutations of boots built on the Barrie last such as this plain toe 5-eyelet design. Altra Lone Peak 2.0 (size 13). China. $120. Purchase. Altra Lone Peak 2.0 NeoShell (size 13). China. $150. Purchase. Altra Lone Peak 2.5 (size 13). China. $120. Purchase. Dirty Girl Gaiters (size XL). USA. $21. Purchase. UPDATE 8/2/2016: I’ve now completed the 165-mile Tahoe Rim Trail in the Lone Peak 2.5’s and their outsole rubber is superior to the Lone Peak 2.0’s. The tread no longer tears off in chunks–not even one chipped lug. The 2.0 NeoShell doesn’t have issues with the sole either. Only the 2.0. Last summer I hiked the John Muir Trail (JMT) and, though very selective in my choice of shoes, was still plagued by blisters and had numbness in my left big toe for months after the hike (due to downhills with shoes that were too narrow). On the hike I encountered many folks on the Pacific Crest Trail (PCT) who had various recommendations for footwear, but most of those who were moving light and fast were wearing Altra’s. I’d heard about them from a Bishop / Yosemite trail running friend prior to my trip, but was unable to find them in my local REI. I wanted to be able to try on the shoes I’d be wearing on the trail before committing to the trip, so Altra’s were out due to lack of availability. Upon returning from the JMT, with my feet in sad shape, I promptly ordered a pair of Altra Lone Peak 2.0s. Greats Royale High in Triple Black (size 13). Italy. $179. Purchase. Oliberte Bokoroo in Bold Black Full Grain (size 13). Ethiopia. $140. Purchase. Two pairs of black hightop sneakers from young web-based brands trying to break off a piece of the industry. Greats Brand focuses on Italian leather and production, while Oliberte uses Ethiopian leathers and Fair Trade Certified production. Both pairs of shoes appear to be free of manufacturing defects (the crinkly look to the leather on the instep of the right Greats shoes is nothing, it’s very soft and supple and has already disappeared as the wear creases have begun). The Greats obviously have a cleaner aesthetic both in the all-black look, as well as the smooth leather, flat waxed laces, high stitch count, and partially hidden stitching on the tongue and cuff. They’re also a bit narrower, which creates a sleeker look, but might not be as comfortable in the long term. 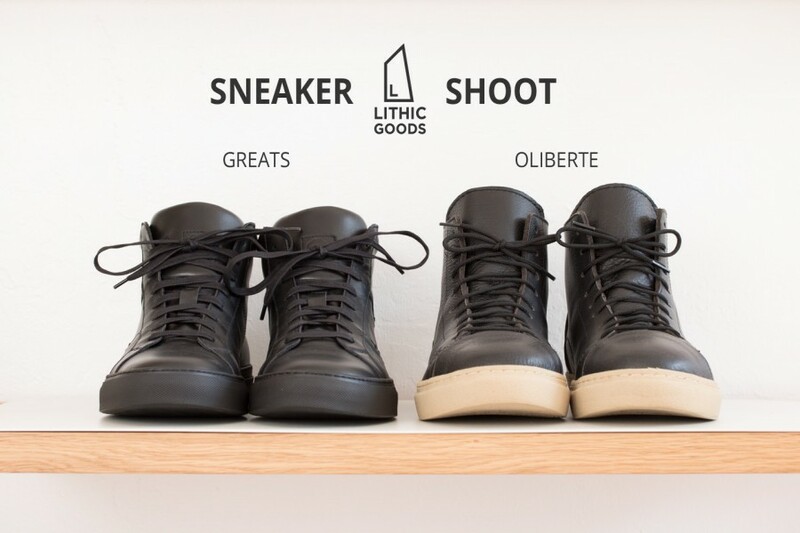 The Oliberte’s have a more rugged aesthetic with the exposed edges at the cuff, zigzag stitching, and pebble grain leather, but are still one of the simplest pairs of shoes offered by the brand. Thus far I’ve worn them more than the Greats, and find them to be super comfortable and durable as I beat them up doing yard work and biking around town. Ethical Note: While I have written this post objectively, both pairs of shoes were purchased at a discount and I stand to benefit if Oliberte succeeds. Red Wing Iron Ranger 8111 in Amber Harness (size 12D). USA. $300. Purchase. I set out to find a handsome pair of brogue-less, cap toe boots that are made in the USA of veg-tanned leather and finished off with a commando sole. 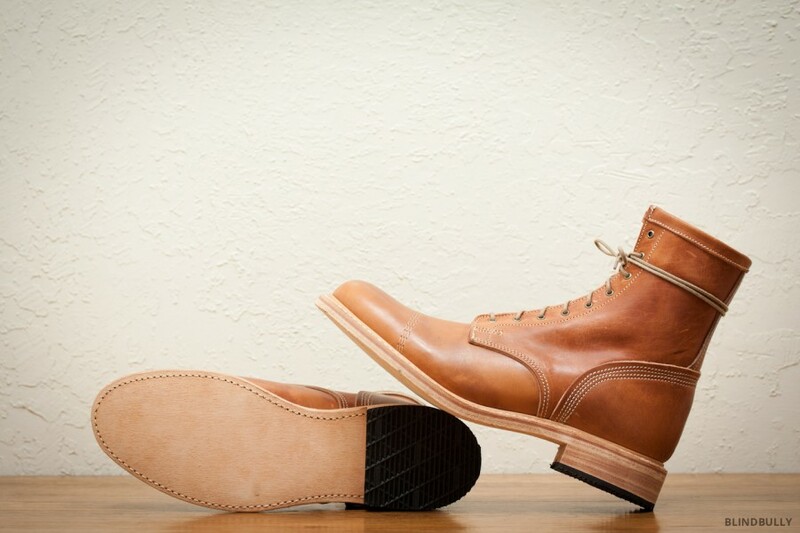 Such a boot is nearly impossible to find (if you’ve found it in a size 12/13 without a six month wait, speak up, unless they are Viberg’s $710 Service Boot, whose price I cannot justify). The Red Wing Iron Ranger was ultimately the closest I could find to my ideal, however it does have a few shortcomings. UPDATE [9.24.14] J.Crew has created a Red Wing Iron Ranger x Beckman, basically the Iron Ranger with the Beckman sole. Not sure what Brick Settler leather looks like in person, but the design is right. UPDATE [11.06.14] New before/after photos posted below from a maintenance session with Obenauf’s leather preservative. The original laces have also been replaced with a leather set. UPDATE [9.7.15] A reader has informed me that Red Wing recently released a new model of the Iron Ranger in Oxblood Mesa with a mini lug Vibram outsole that they’ve numbered 8119. They’re $320 on Amazon and, until I get a pair and document, customer photos can be found on reddit. Alden for J.Crew Natural Cap Toe Jumper Boot (size 12). USA. $547. Purchase. Oak Street Bootmakers Natural Cap Toe Trench Boot (size 13). USA. $426. Purchase. Red Wing 9016 Beckman in Cigar Featherstone (size 12). USA. $330. Purchase. 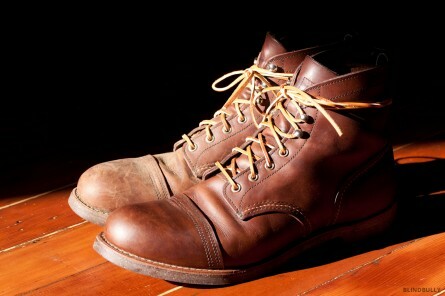 Wolverine 1000 Mile Rugged Boot in Brown (size 12). USA. $355. Purchase. Timberland 6 Inch Zip Earthkeepers Boot in Burnished Tan (size 13). Imported. $170. Purchase. To preface, I’m partial to the following: a true goodyear welt for resoling and longevity, cap toes to aesthetically break the length of the shoe (I wear a Brannock size 13, but for those that run a size large I ordered down as noted above), a method for speedily donning the boots, clean edges on cut leather (as opposed to broguing), a sole with traction since these are for NYC winter, leather lining for boot longevity & comfort, and made in the USA. It should also be noted that I’ve updated this post a few times to improve the formatting and better articulate my thoughts. Clarks Desert Boot in Bees Wax Cleaned with Saddle Soap. Boots $130, Saddle Soap $9, Leather Lotion $9, Coconut Oil $21, Leather Preservative $12. I’ve had these boots for a year and have worn them hard; daily in NYC, as well as on short hikes in Austin, TX and Portland, OR. 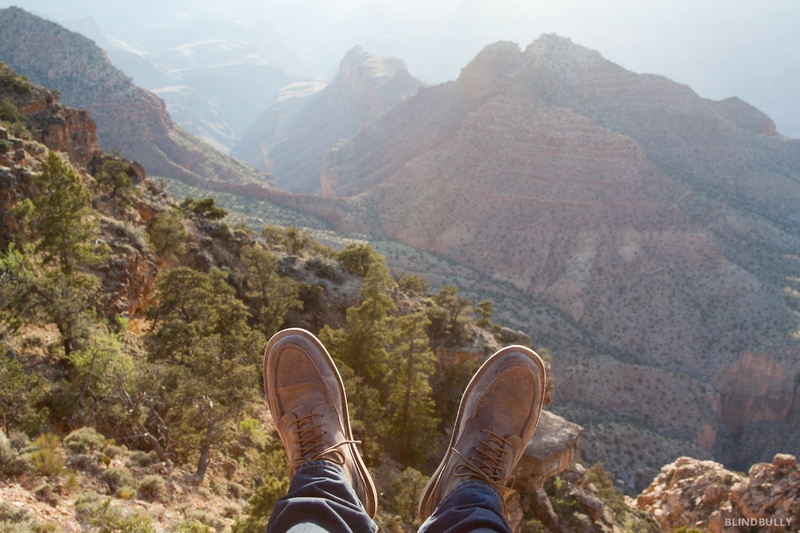 They’re not the ideal hiking boot, but when traveling, they are so light and versatile it’s too easy to wear them to work, the airport, and have them as the only shoe on a trip. During this year of abuse, the only care they’ve received was a new pair of laces after the original pair gave out on my walk to the office. With winter approaching, it was time to clean and restore them before the salt water puddles resume their assault on the dried, porous leather. The technique used here is quite simple and successfully brought my boots back to life. As visible in the photos they were thoroughly scuffed, but after a quick clean are, once again, presentable. 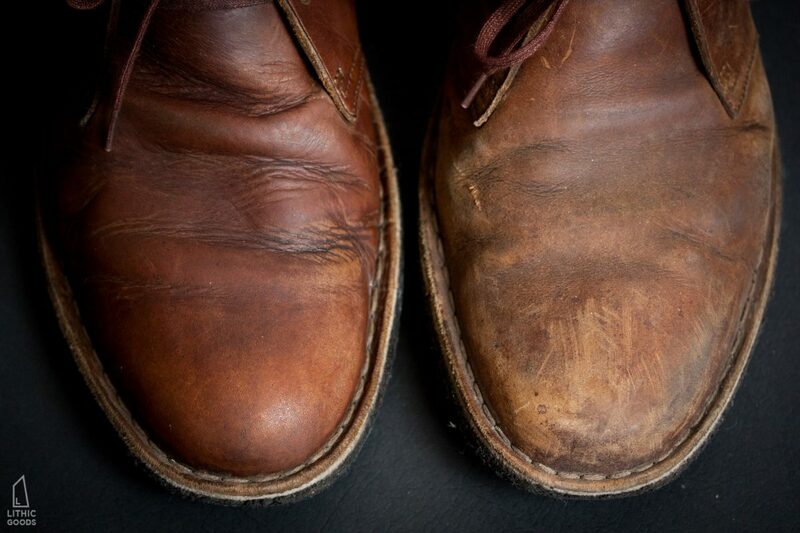 Saddle soap was used because of the amount of dirt caked onto the shoes and the length of time gone without cleaning. However, it mostly cleans, so always use a conditioner after cleaning with soap. These boots have been worn frequently in the rain, which pulls oils from the leather, so they were pretty dry going in. I’ve selected Allen Edmonds Leather Lotion as the conditioner to add oils back into the leather and prevent drying or cracking. All it takes is a damp cloth, saddle soap, a dry cloth, leather lotion, and a bit of elbow grease. Remove laces and use a damp cloth to gently wipe off surface debris. 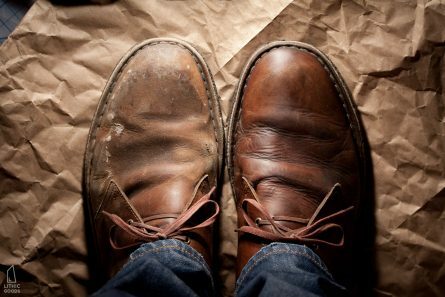 Gently, because you don’t want to scratch the surface of the leather with the dirt currently on the shoe. This is the same concept as when you’re washing a car, so wipe in a direction where the small scratches that inevitably do occur won’t be noticeable (this is usually parallel with the existing scratches). Thoroughly rinse the cloth of debris and give a good squeeze to return to damp status. Rub the rag in saddle soap and apply a thin film to the leather uppers. The saddle soap is a translucent whitish color, you want to put on enough to let the leather soak up some of the soap, but not so much as to have clumps of the translucent soap visible. It won’t hurt if you over do it, but it’s wasteful. Let it soak in for a few minutes and wipe off any excess along with this second round of surface debris. Apply more saddle soap as needed and buff it into the shoe. This is also the time to scrub away any serious build up of dirt or dye. I’d worn a new pair of dark blue chinos, which deposited dye onto the leather, but with a bit of scrubbing it was possible to remove the blue from the shoe. With your shoe clean and lightly oiled from the saddle soap, it’s time to add the lotion that will condition and penetrate into the leather to maintain the leather’s flexibility and prevent water from being able to soak into the leather. Do this with a clean, dry, cotton cloth. Lightly buff the shoe to a dull sheen, aware that the color will be darker than it was originally.